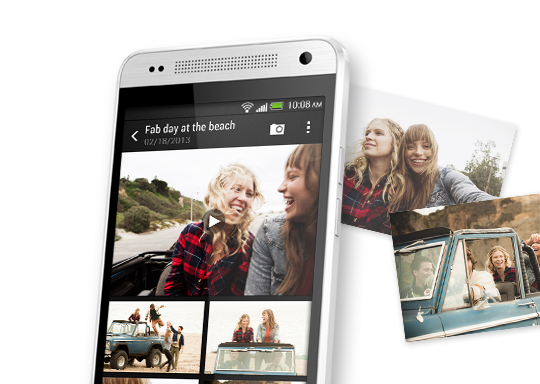 HTC today has announced its sleek and slender HTC One mini. Its economy of scale brings to mind E.F. Schumacher's 1973 book, Small is Beautiful, especially in a land of ever-larger smartphones. The HTC Mini One's polished aluminum body, with a choice of Glacial Silver or Stealth Black, measures 132mm x 63.2mm x 9.25mm (approximately 5.19" x 2.48" x 0.36") and weighs 122g (0.42 ounces). Available capacities vary, up to 16GB of internal storage; there is not option for removable media for storing photos and videos. 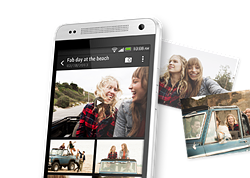 Powered by a dual-core 1.4 GHz processor, the HTC One mini runs the latest version of Android with HTC Sense. More compact than its HTC One sibling, the slender One mini may fit into the pocket of your skinny jeans. As expected, the HTC One mini is equipped with HTC Zoe and the ability to automatically create 30-second highlights of your images. The phone features a 4.3-inch, 720p display and an UTC UltraPixel camera with a BSI (back side illuminated) 1/3" sensor, f/2.0 aperture and 28mm lens. HTC claims that the One mini's sensor captures 300% more light than traditional smartphone sensors, promising above-average performance in low light. Output strength from the five-level flash is automatically adjusted according to camera-to-subject distance. The 4-megapixel rear camera captures full HD (1080p) video, while the 1.9 megapixel front camera records 720p video also uses a BSI sensor. HTC Zoe is included, with all the features you expect including 30-second highlight clips. Pricing will be announced later this summer. HTC expects to ship the One mini to select markets in August, with global availability in September. For detailed specifications and more information, visit the HTC site. Not exactly mini, more like regular size. But that aside, those are solid specs, the phone is good looking, and hopefully can produce photos that match its bigger brother in quality. HTC One is too big and too expensive for me, but this slightly smaller version is what I'm looking for as a replacement for my current phone (4.2" screen). And I totally don't see much to complain specs wise. 1080p screen of this size would be a waste and unnecessary. And lower resolution means that less CPU, GPU and battery power is needed to make it run smoothly. One can complain about 1 GB of RAM and 16 GB of unexpandable storage, though. If only they can price it competitively, it will be my next phone. HTC, please don't let me down. HTC's Wildfire was significantly more compact than many current smartphones, but you don't get much content onto that low res screen. A good idea, but a slightly frustrating reality - whereby some apps are not really usable. This, though, looks quite promising. Thanks! Looks like we missed a "2" there: that's 122g, we've corrected above. Chinese Android phones are producing 6mm thick phones! No NFC and no OIS for the camera is somewhat disappointing... Lower res display too (though a year later I continue to be impressed by my own phone's 4.65" 720p display, EVO LTE). It's definitely a mid-range model capitalizing on the flagship's name rather than a small flagship model a lot of people would want, not even that much smaller at that. I thought they struck a better balance last year with the One X and One S, the latter retaining most of the larger model's specs while being substantially smaller. I think a lot of people out there would prefer smaller 4" phones, women in particular who tend to stuff them in tiny pockets.